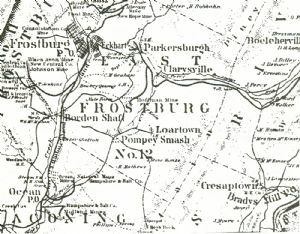 The town of Pompey Smash is between Midland and Clarysville in Western Allegany. This is the story of how it got its name. From the Journal of the Alleghenies, vol XXI, 1985, and used with permission. The map from the 1870s shows the location of Pompey Smash, slightly below mid-point.